"Wherever there is a human being, there is an opportunity for a kindness. " Sometimes it is hard to imagine how can some people be suffering and yet they are all alone in their battle. I asked that question to myself one time as a a teenager when I saw that old sick man living all alone by himself in a make shift house on my way to school. Abandoned by his family? His friends? I assumed he died a lonely man. He probably suffered less than his illness compared to his solitude. I will never forget his face and his fate. Life's journey is a constant struggle. But it must not stop us from holding on to hope. Braving life's enduring tribulations is more assuring when we know we are encircled by the people who care for us and will be there to support us. 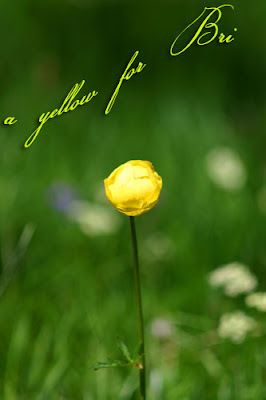 When I read about Click's current theme for the month, Yellow for Bri I was moved to tears. Bri's story and her struggles touched me undeniably. It was so unfortunate to have discover her blog this way. I guess there's really so much blog to discover and explore ahead of me. Bee and all the other bloggers tenacity and compassion in pushing through a fund raising campaign for Bri is truly admirable and worth emulating. As Bee put it, this special edition of Click is tinged with sadness and yet filled with hope. Please go check in here on how you we can help Bri on her battle. 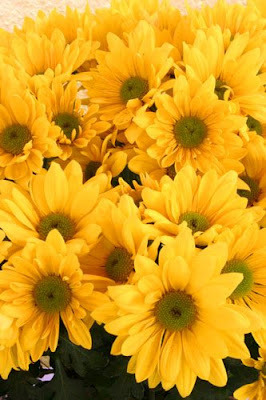 I am sending these flowers for Bri at Jugalbandi's Click event , to give her courage and inspiration to continue hoping. You are not alone Bri. 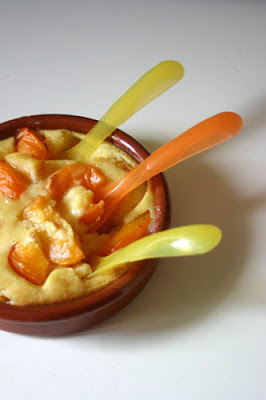 While this delicious Apricot Gratin will go over at Mamina's place Food Matters, the host of this week's Weekend Herb Blogging. Thanks again Kalyn for this creating this event. Wash and cut the apricot of your desired size. Then spread evenly the fruit on your baking dish. In a bowl, beat the eggs and two egg yolks with sugar, flour and vanilla essence. You will obtain a creamy mixture. Cook over bain marie as you beat it non stop for about 4 or until it thickens. Pour slowly the fresh cream as you continue to beat the mixture. Cut the fire. Pour the sabayon over the fruit and bake for about 10 to 15 minutes at 200° celsius. Before the end of the baking time, check regularly to avoid burning the surface. What a warm and lovely post this is, Dhanggit. And that dessert looks scrumptious! 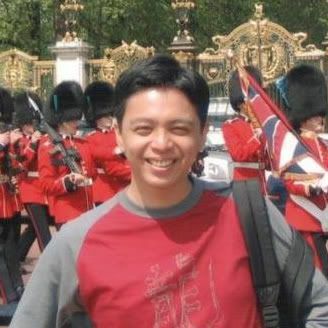 This is a touching and kind post Dhanggit, a wondeful entry! As for your dessert, I could use all the three spoons myself. I love apricots and can't wait until they'll be in season here. have a great weekend to all!! Mmm, this looks delicious. I just made something yesterday with apricots too. I just read about Bri, right before this. It's really unfortunate that I just discovered her blog now, because it's wonderful. Like yours! How's that French weather?? Lovely post. Great looking recipe. Lovely post. Sometimes the good efforts of just one person make a diffrence. Its admirable how the whole food blog community is rallying around Bri. And your dessert looks so good. I liek your new header. This sounds so light and refreshing! I love sabayon! Apple gratin? you make such amazing combinations of stuff and they all look so fantastic! This is a great entry! Beautiful post and beautiful food for a great cause. Gorgeous flower shots, especially the yellow daisies. 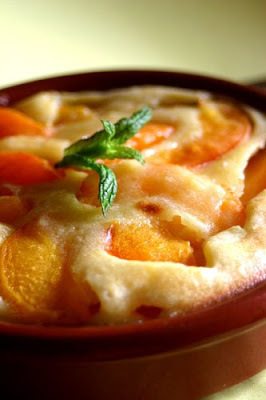 The apricot gratin sounds delicious - thanks for sharing the recipe. Can't wait to try this ! Hope it will come out good as like this :D! I have three tiny ripe apricots in my fruit bowl. I wonder if they are enough for this. Hmmmm...must do the conversion. Truly lovely, Hilda. What a beautiful yet simple to prepare dessert. Thanks for you comment..you know the funny thing about the cupcakes is I didnt even think I liked Boston Cream Pie..I originally made the cupcakes for my sister..I tasted them...and Amen...I am a reformed Boston Cream Pie hater!!! 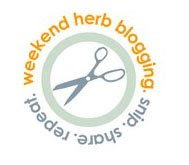 And yep...my hip have gotten 9 lbs bigger since I started my blog! And 9 lbs is ALOT of weight on 125 lbs.. I guess I should start dieting AGAIN!!! A lovely post Dhanggit and great photos. What a lovely post, and your photos are wonderful. Sounds delicious too!